Marcus Ford - Neil Drover - agency for live music, presenters and entertainers. 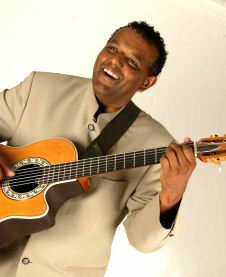 Marcus Ford is one of the UK's leading finger-style jazz guitarists. Marcus presents a solo repertoire founded in classic Jazz tunes such as "Mona Lisa", "What a Wonderful World", "Sunny" and "Someone to watch over me". His style is cool and intimate: the sound tastefully luxurious and self-contained. Marcus has performed all over Europe including The Shetland Folk Festival, Moods Jazz Club in Zurich, Edinburgh International Jazz Festival, The Glasgow Jazz Festival, The Berlin Centre in Germany as well as a number of live concerts for BBC Radio 3 and BBC Radio Scotland. In January 2008 he made his fourth tour to China performing for The British Chamber of Commerce and later in the year will be performing alongside Martin Taylor; generally considered to be one of the worlds greatest Jazz guitarists. As well as concert and session work, Marcus Ford is an ideal choice for corporate entertaining, weddings and private functions. His experience and talent offer a special touch that will make any event a memorable one.